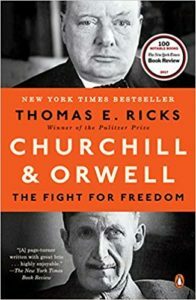 Churchill & Orwell by Thomas E. Ricks Review | What Would The Founders Think? The pairing of Churchill and Orwell in a title attracted this reader’s attention. That they were both superb writers did not seem adequate justification. Thomas Ricks explains that both were dedicated to preserving freedom, albeit in different ways. It is an intriguing title, but the author had to strain to maintain the connection. Ricks’ enlarges understanding of the times in which Churchill and Orwell lived. It should be read to better comprehend the world in which we live. The two men’s life stories, personalities and achievements differ greatly. Churchill was born in 1874 to wealth and social standing. He devoted his life to preserving and defending the British Empire. He was a flamboyant extrovert and public figure. The writer we know today as “George Orwell” was born as Eric Blair in June 1903 in Bengal, India, where his father, the son of an officer in the Anglo-Indian army, was a low-ranking bureaucrat in the Indian Civil Service’s department responsible for overseeing the growing and processing of opium. Orwell was phlegmatic, introverted, and an idealist who abhorred colonialism. He waged war on freedom’s enemies with words, although when the need arose, he used more conventional weapons. He excelled at boarding school, despite having to work odd jobs to eat. Churchill was uninterested in school and a mediocre student at best. In August of 1893 Lord Randall Churchill wrote to his son Winston and cruelly predicted his future. You will become a mere social wastrel, one of the hundreds of the public school failures, and you will degenerate into a shabby unhappy & futile existence. If this is so you will have to bear all the blame for such misfortunes yourself. At the time, offspring of British aristocracy judged too dull for other careers were shunted into the army. Serving as a young cavalry officer in Bangalore, India in 1896 Churchill belatedly discovered a “desire for learning.” He became a student of the classics and history. The History of the Decline and Fall of the Roman Empire was a favorite. “He went looking for wars to write about, with the intention of shedding some glory on himself and using that as a platform to launch himself into politics. Churchill sent dispatches to London newspapers about fighting on the Afghan-Indian border in 1897. A battle between the British and local Pashtu tribes, although a minor one, apparently gained importance in his telling. The Story of the Manaka and Field Force was published in book form in 1898. “Nothing in life is so exhilarating as to be shot at without result,” Churchill wrote. Churchill left the military and used the popularity of his book to accompany the British expeditionary forces fighting Islamists in the Sudan. He turned that experience into another book and ran for Parliament in July of 1899. He was 25. He was narrowly defeated, but becoming known. He then went to South Africa to fight in what later became the Boar War. He acquitted himself well as soldier and war correspondent, further burnishing his reputation. He returned to England to re-launch his political career. Not long after, he was elected a Tory Member of Parliament. Only four years later he left the Conservative Party and became a Liberal. He was not a party man. That was the truth. His loyalty belonged to the national interest and to his own. At one time or another he stood for Parliament under six labels: Conservative, Liberal, Coalition, Constitutionalist, Unionist, and National Conservative. This was partly due to his failure to find a safe seat, or one he could hold.1. By 1911 Churchill was first lord of the admiralty, overseeing the Royal Navy. He helped plan the British landing at Gallipoli in Turkey and was blamed for the failure and the losses. Out of office, he did penance by volunteering for the war in France where he saw action in 1915. His experience in the trenches gave him an understanding of soldiers and officers that would serve him well as WWII prime minister. When his battalion was dissolved he returned to England and politics. By July of that year he was back in the cabinet as minister of munitions but was defeated for reelection in 1922 and 1923. 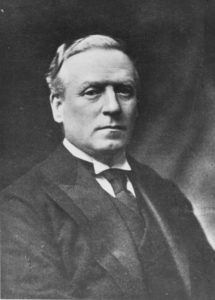 At the end of 1924, when the infant Labor government fell and the Conservatives took power again, he was appointed Chancellor of the Exchequer. That must have afforded him satisfaction. It was the highest position of his father’s career, held by Lord Randolph for five months in 1886. A second Labor government replaced the Conservatives and Churchill was job-hunting again. The wretched prisoners huddling in the stinking cages of the lock-ups, the grey cowed faces of the long-term convicts, the scarred buttocks of the men who had been flogged with bamboos . . .
One of the points of the novel is that the English people, as well as the Burmese, are crippled by the imperial system… (I)n Asia he learned how the exercise of power can corrupt a person. He hated what he saw it do to himself and feared what would have happened to him had he remained in the role of enforcer of colonial law. When the white man turns tyrant it is his own freedom that he destroys. He becomes a sort of hollow, posing dummy, the conventionalized figure of a sahib..
To atone for his time as an oppressor, Orwell began a lengthy process of self-abnegation. He spent time living as a tramp in England. Then, in the spring of 1928, he immersed himself in the Paris underworld. At the end of 1929 he returned to England and Down and Out in Paris and London was published. It was his first under the name George Orwell. If Churchill spent his early years in pursuit of fame and political position, Orwell spent his rebelling against colonialism, writing novels and searching for something on which to pin his hopes for a better world. He found it in socialism. Orwell went to Spain as a war correspondent and to fight on the Republican side in the Spanish Civil War in 1936. He was in as much danger from the communists on his side as from the fascists he had come to fight. He recognized both as enemies of freedom. For both Orwell and Churchill the 1930s were formative and harrowing. It was a time of the global Great Depression. The probability of war darkened the future. Some saw liberal capitalist democracy as a failure and thought the way foreword was a choice between fascism and communism. Many flirted with the latter. Orwell was not among them. Orwell became a political writer with the publication of The Road to Wigan Pier in 1937. It is a bitter account of his experiences of poverty and injustice among the working class in industrial England and an argument for socialism. Homage to Catalonia, written in 1938, was drawn from his experiences in Spain and condemned both communism and fascism. Friends on the left denounced him. His publisher refused his books. Churchill was elected to Parliament in 1924. He retained his seat in the House of Commons despite opposing the majority of his party. He was against independence for India, railed against India policy and angered party leaders. He objected to Prime Minister Neville Chamberlain’s willingness to appease Germany and the Munich agreement. Churchill understood that making concessions from a position of weakness was a losing strategy. In 1939, the Munich Agreement collapsed, just as Churchill had predicted. In August Germany signed a pact with Stalin to carve up Poland and Russia annexed the Baltic States. Opinion swung Churchill’s way. He was the natural choice to lead Britain through the war. And lead he did, masterfully. Churchill was everywhere, rarely taking time to sleep, plotting strategy, harassing armament manufacturers and workers to work harder and longer, reorganizing the military, raising public morale and cajoling President Roosevelt to bring America into the war. Space prohibits the author’s detailed account of those fraught days and what was accomplished. Orwell was adamant that Britain not capitulate. Rejected by the army because of weak lungs, he joined the BBC’s Overseas Service in August 1941. For more than two years he engaged in the kind of propaganda that he spent much of his writing life denouncing. He resigned from the BBC in September of 1943 to devote himself to writing. He completed Animal Farm in February 1944. It would not be published until late in 1945 when the war in Europe was almost over. Publishers were leery of offending the Soviets, now an ally, with an unflattering allegory of the early days of communism. Animal Farm was a success, contrary to Orwell’s earlier books. For the first time in his life, Orwell was a literary and financial success. He began to write 1984, (reviewed here) his last book, in the spring of 1946. It is a dystopian novel about post WWII Europe. It takes place in Oceania, a totalitarian superpower in which individual thought is banned. The protagonist, Winston Smith, works for the Ministry of Truth. His job is to rewrite history to glorify the state and its leaders. Winston hates it. Early in the book he thinks If the Party could thrust its hand into the past and say of this or that event, it never happened—that, surely, was more terrifying than mere torture and death. It is a world in which objective reality does not exist, or at least is illegal in the omniscient state. “Thought Police” conduct continuous surveillance to monitor thinking and speech. Winston wrote in his diary, Freedom is the freedom to say that two plus two makes four. If that is granted, all else follows. He is betrayed. His inquisitor tells him that the belief that reality is something objective, eternal, existing in its own right is false. Whatever the Party holds to be truth is truth. It is impossible to see reality except by looking through the eyes of the Party. Orwell’s health was declining and interfering with his writing. He feared he would die before he could finish the book. His laboriously typed manuscript reached the publisher in December of 1948. It was published on June 8, 1949. 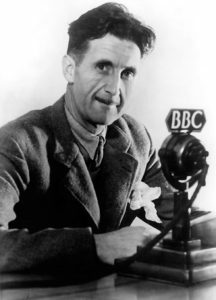 Orwell lingered until January 2nd of 1950. He was 46 years old when he died of tuberculosis. Orwell was a dreamer, but one with the ability to recognize duplicity and the talent to expose it. The author credits Churchill for being the more historically significant because he ”helped give us the liberty we enjoy now.” Churchill was a politician who became a statesman. He was a man of action who, under enormous pressure, made consequential decisions. In this reader’s view, Orwell and Churchill operated in such vastly different arenas that judgments about enduring influence require too many qualifiers to be useful. But that is a minor quibble. Ricks’ book is well researched and entirely absorbing. It includes some intriguing but little known facts about both men. Most important, Ricks’ enlarges understanding of the times in which Churchill and Orwell lived. It should be read to better comprehend the world in which we live. As usual I enjoyed your article very much which also included the inside webs. Thank you, Ann. I am glad you enjoyed it.